Total reviews: (0) Write a review? 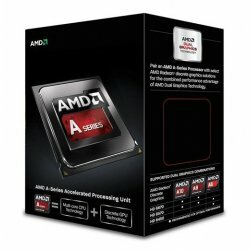 Choose AMD to get the Accelerated Processing Unit in your next PC project. AMD’s A-Series processors combine dual-core and quad-core CPUs and AMD Radeon Graphics on a single power-efficient chip to enable premium performance and low power consumption. Now you can get the best of all worlds. The performance of multicore CPU technology and the brilliance of premium AMD Radeon graphics technology — all in a single chip, at a great price! - Watch movies, play games and get more done with Windows 8 apps, media and more.